I just notice recently, that lot of Earlyface Users mainly newly registered members find it difficult to create new topics/posts on this Forum. That's why I carved out time to write this article hoping that it will help out. Therefore, without wasting much time, let me hit the hammer on the nail. Young Earlyfacians are Earlyface registered users who have made at least 10comments on this Forum. I love them so much. Login to your Earlyface Account or Register if you are not a member. Click on ''Forum'' at the top of this site. Scroll down and click the Category/subBoard that best suit what you wanted to post i.e news, tutorials, free broswing cheat, updates, etc. After you are done with writing your posts and filling the topic on the subject line, you can then hit the ''POST'' tab to publish them. Done!! NOVICs are Earlyface registered users who have never made any comment/contribution on this Forum. We regard them as selfish fellows. They are only here to get what they want without even showing appreciation. I hope you aren't one of them? First, you must reply/comment to a Topic posted by another user to get started in order for the ''NEW TOPIC'' button to appears for you. Then select which section (forum Board/Category) you would like to create a new topic. Click the "NEW TOPIC" button, do your thing the similar function as Young Earlyfacian. That's it! Note: It is important to note that you should read to observe the Earlyface Forum posting rules before going ahead with composing your post. How To Know the Group that you belong? If you are confuse about the one that you belong to on this great forum, simply click on ''PROFILE'' at the top of this site. It is there on your profile. Are you a NOVICE, Young Earlyfacian, Flower Member, Sweet Member, SweetPlus, Peace Member, Teacher Member, Gifted Member, Golden Member, Earlyface VIP? GUESTs are regarded Earlyface visitors who have not register as a full member. Some of them visit www.earlyface.com.n g daily to get information but lack desire to join us. Some even thought Earlyface is a blog. At the moment, as a Guest you cannot create a NEW TOPIC on this forum. Recently, guests can comment on some topics with a verification. You can comment on topics on the following boards; Ask For Help and Get Answers, Questions, Polls, Opinions and Debates, Files Free Download Links, Nigerian Students Forum, Online Businesses, Free Adverts And Sales PlatForm and on Gallery. You can still Register and secure your Account with us today. 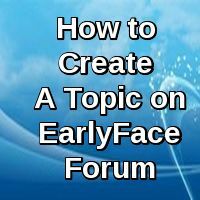 If you are finding it difficult to register with us, kindly read this: Earlyface Forum Registration Help. D. How To Post Reply/Comment to a Topic? To post a comment in an existing topic is very simple, just click on the ''REPLY'' button which is located both at the top and bottom of the topic. You can as well write a post when viewing a topic without loading a new page using 'Quick Reply' Option. E. How To vote a Poll? To vote in a poll, you simply have to select your chosen option(s) and then click on ''Submit Vote''. You may also be able to do other things with the post, such as attaching a file. For further explanation check Posting A Topic on Simple Machines Forum. That is all about posting a ''NEW TOPIC'' and ''REPLY'' on EarlyFace. Hope it's very simple and understandable? If you still have any Questions to ask me based on this, feel free to ask now. I will reply you Asap. Enjoy your stay!! We promise you the BEST.